An extremely rare plan of the Holy Land issued in Wittenberg, Germany, around 1670 for Martin Luther's Protestant translation of the Bible. This rare Bible contained several early maps of the Holy Land drawn by Georg Andreas Bockler. All examples of Bockler's work are extremely rare and are almost always, as in our example, exhibit condition issues. This particular map depicts the Near East from Cyprus to the Persian Gulf extending as far north as Armenia and as far south as the Red Sea. Portraits of Adam and Eve appear in the upper left and right quadrants. Jonah and the Whale appear in the Mediterranean. A winding path from Egypt to the Jordan River attempts to show the wandering of the Israelites following the Exodus. Another path leads from Canaan to Babylon. Georg Andreas Böckler ( 1644 - 1698 ) was a German architect, engraver, and engineer who wrote is best known for his lavishly engraved Architectura Curiosa Nova (1664) and Theatrum Machinarum Novum (1661). Based in in the city of Nuremberg, Germany, Bockler specialized in hydraulic architecture. Architectura Curiosa Nova was his most important work. It is mainly a book on theory and application of hydrodynamics for fountains, water-jets, garden fountains and well heads with many designs for free-standing fountains. The fourth part includes designs for grottoes and garden pavilions. In 1661 Böckler wrote Theatrum Machinarum Novum, an important work on windmills, pumps and other hydraulic machines. 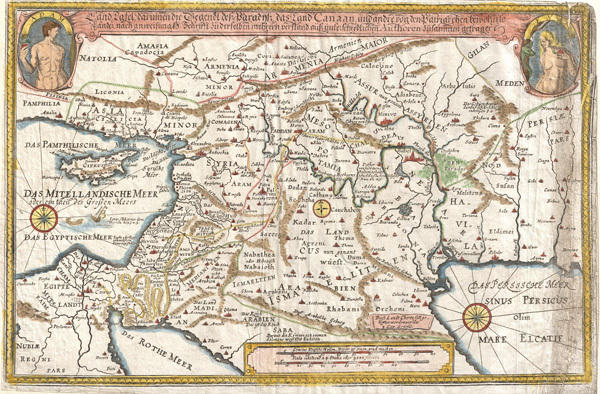 Cartographically Bockler did little work but his corpus does include several important and scarcest maps of Jerusalem published in a 1670 edition of Martin Luther's Protestant translation of the Holy Bible. Bockler's name is sometimes written as Boeckler. Biblia, Das ist Die gantze heilige Schrifft Alten und Neuen Testaments, Deutsch (durch) D. Martin Luther, (Wittenberg) edited by B.C.Wust, 1670. Average. Right edge exhibits some old restoration and discoloration. All margins narrow.